All of you, fight on! To the last breath FIGHT ON! 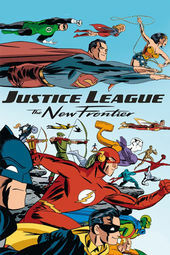 Nautilus rockets, McCarthyism in an Atomic Age, moonlit-framed rooftop chases, lightning bolts that echo Saul Bass, and a symphonic score by Kevin Manthei punctuate director and title designer David Bullock's opening to Justice League: The New Frontier. A production breakdown with Director DAVID BULLOCK. 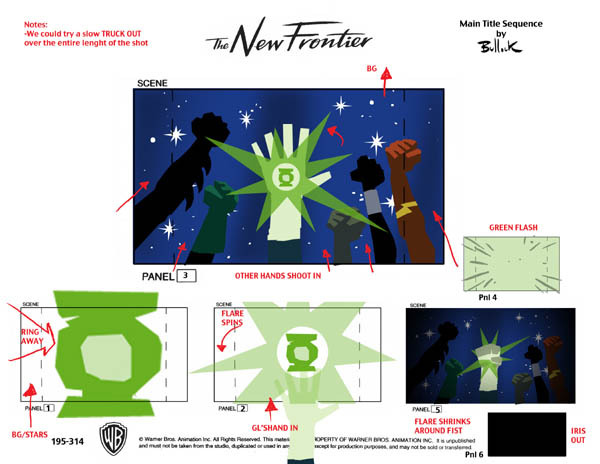 DB: I put these together with a great compositor by the name of Aziria Owens. Azi would, in After Effects I believe, build the shots from layered storyboard files that I "cut" in Photoshop. Once the individual shots were finished they went to WB's editing department. Some of the Avid work is a bit clunky, but this thing had no budget! 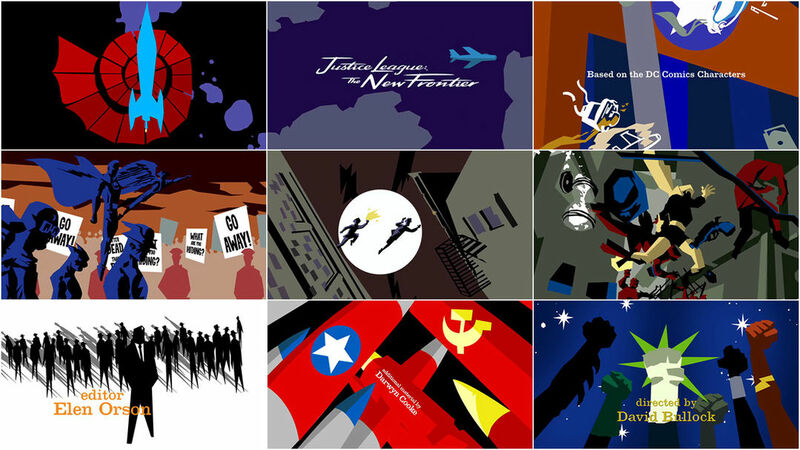 Going for a Saul Bass approach was not only the right design approach, it was economical as well. Although we had no real money I agreed to put the titles together on weekends over the course of two to three months while I directed Sony's The Spectacular Spider-Man toon. Overall, the movie was robbed of time. Darwyn and I had many discussions on how to cram story information into the titles as well as how to set the tone. And even more discussions about fonts! I based at least half of the shots on Darwyn's NF comic covers and interior pages. All that was left to do there was to choose a great "Blue Note" color scheme and figure out how to get in and out of the shot. The remaining shots were attempts at capturing the tone of the era's design greatness. Kevin Mathei came up with an ever-building soundtrack that really adds intrigue to the piece. Honestly, I was all about a Brubeck-style jazz approach, and would still have liked to pursue it, but I was outflanked by producers. Remember the great Johnny Quest title music? That's what I'm talkin’ abooouuutt! That said, I'm very happy with what we have. Anyway, it was a great opportunity, and I revelled in it!